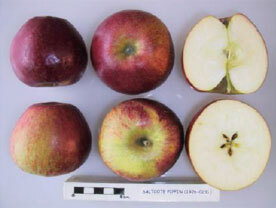 The Saltcote Pippin is a variety cultivated by James Hoad of Rye from either a Ribston Pippin or Radford Beauty seedling. First recorded as a variety in 1918, it was awarded an RHS Award of Merit 1928. It is currently cultivated as part of Brighton Permaculture Trust’s -:- National Collection in Stanmer Park, Brighton. You can see a Saltcote Pippin apple tree (planted 2010) in Home Farm Orchard, Stanmer Park ( map). A medium to large, handsome apple, it has a rich, aromatic flavour. It is sharper and not as intense as Ribston Pippin but has a similar rather open texture. It becomes sweeter, milder and more aromatic as it ripens. Flat, rectangular to conic shape. The shape of the apple and the texture of the skin is often uneven. Pale to golden yellow in colour with a orange red to carmine flush with some russeting on the body of the apple. The fruit can be picked in early October and stored until November to January. The Saltcote Pippin is a moderately vigorous, spreading tree which crops well.